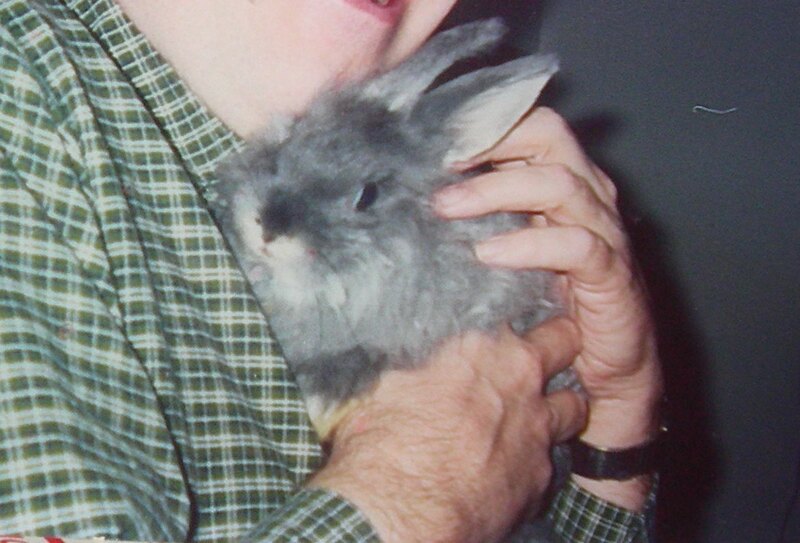 Brillo Marcussen, English Angora Rabbit, age 11, died peacefully at home Sunday evening, January 10, 2016. He was surrounded by his loving family. Interment took place January 14, as the weather warmed enough to permit burial. White carnations adorned his portrait. Born November 2, 2004, Brillo was named after a common, household cleansing pad since, as a baby, he was so tiny and his angora fur so spiky, that the resemblance was brought to mind. Like the hard-working cleanser he was named after, Brillo was an industrious fellow, and he went on to lead a healthy, busy life, characterized by constant cheerfulness and a willingness to participate in household events. During his long life he held many illustrious positions, including: consuming and controlling dandelion weeds in the spring, producing compost additives for the garden, and was occasionally known to generously donate some of his long, silky, angora hair to knitters after being groomed. Among his family, he was known to have a huge appetite for life. He was always helping with kitchen chores, eagerly disposing of produce scraps, and he kept his portion of the house well cared for, always being sure to use his litter boxes. He was a gourmet vegetarian, whose choice of meals included various fresh ingredients, such as green beans, carrots, spinach, cucumbers, broccoli, and hay – to name a few. He did not like green pepper, however, and would frequently thump his displeasure were it to be included on his plate. For his last meal, Brillo was able to eat a little banana, his personal favorite. He will be most remembered by his family as someone who had a great zest for life, a joy for playfulness, and a comforting snuggle to anyone who needed him. He is greatly missed.